Pizza is a universal food that everyone likes! It's also a great way to incorporate some healthy ingredients for your children to eat. 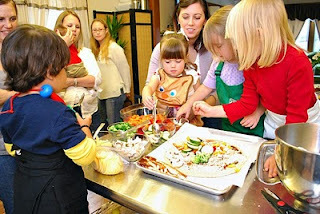 For our September's Kitchen Playdate, members of my group, What's Cookin, Mama, joined us in the kitchen as we had fun topping our own pizzas! If you're looking for healthier pizza topping ideas or ways to squeeze in more vegetables into our diets, I highly recommend you bring your kids into the kitchen and have yourselves a pizza party. This was such a fun event for everyone that attended. 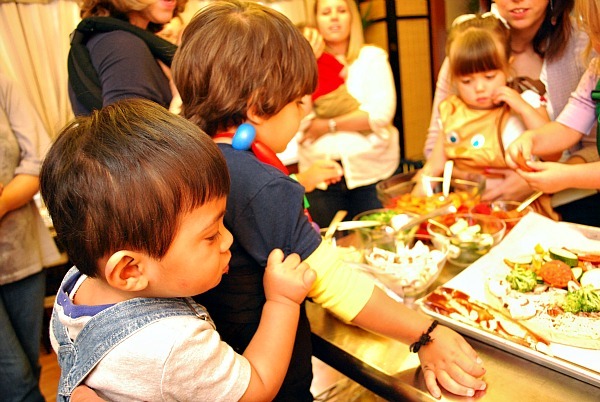 While us mamas were having fun making pizzas with our older kids, our little ones had a playdate together so everyone had a good time. For this event, everyone brought one favorite pizza topping or veggie they wanted to use on our pizzas. 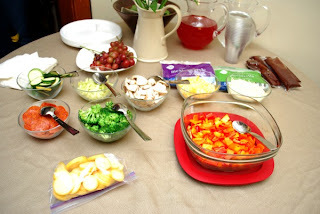 We put them on our pizza topping bar and it was quite a colorful and healthy spread of toppings! 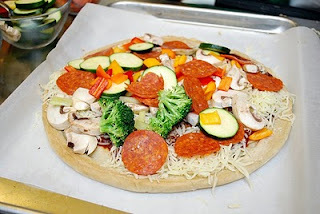 We had sliced zucchini, yellow squash, banana peppers, sliced mushrooms, steamed broccoli, diced bell peppers and pepperoni. We also had 2 kinds of cheeses and a zesty pizza sauce. 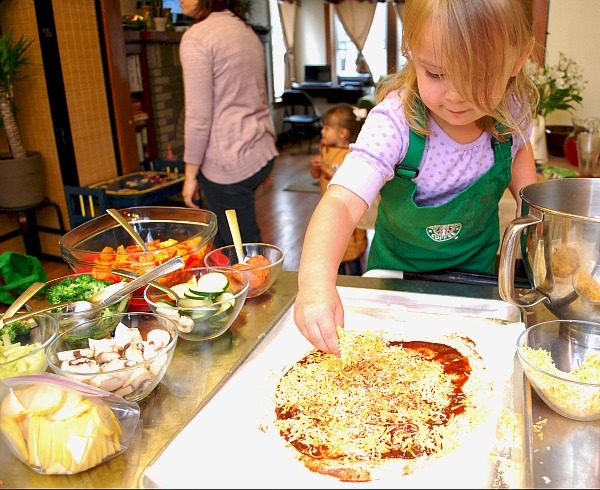 Clara and Natasha got in on the action by adding some healthy color on top of the pizza too! 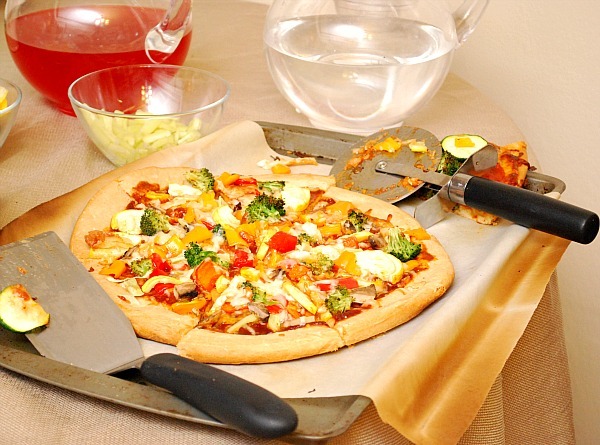 Pizza is a great way to teach kids about various vegetables, different colors and shapes. 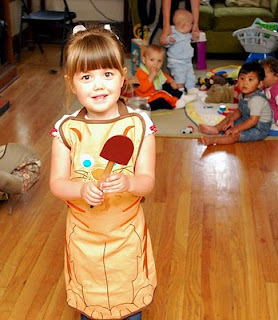 To the kids, it's an artistic craft of making something edible. 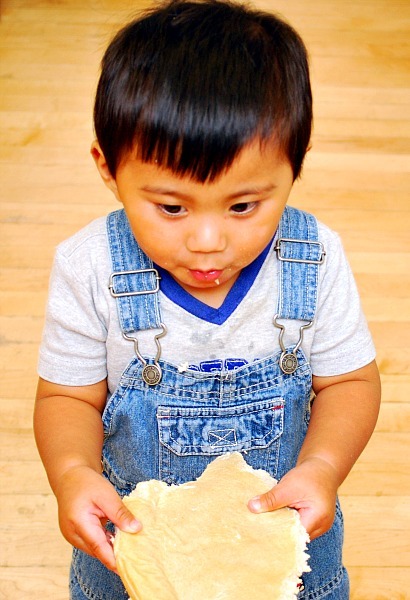 For us parents, it's great to see the kids willingly use fresh vegetables and ingredients... and eat it too! 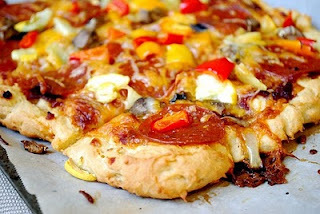 Here's one of the pizzas the kids made using the pre-made crusts before it went into the oven. See how lovely it came out, chockful of healthy veggies & a nice dose of pepperoni?! What a difference a little cooking makes! This pizza came out perfectly golden with a crisp crust and the kids (and moms) loved it! Here's Brynn working on the homemade pizza crust. She went to town topping it and did an awesome, delicious job! Since I couldn't enjoy all the kids' pizza creations (as the doughs involved wheat flour), I made a gluten free pizza dough and topped it with the ingredients available. It came out delicious and you can find the recipe for it here! So what was my dear Joel doing while the older kids were making pizza and the smaller kids were playing with toys? 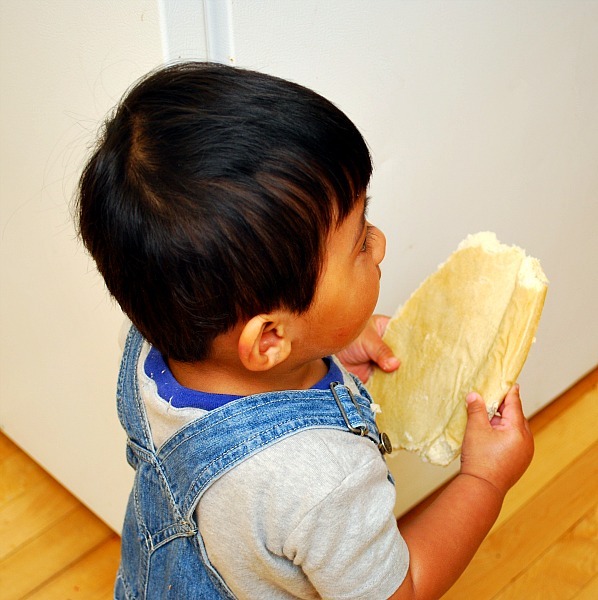 Joel snagged some pre-made pizza dough and began eating it when we weren't looking! He was caught red-handed and didn't care lol. I guess he couldn't wait for us to top it and bake it, so he took matters into his own hands... literally! 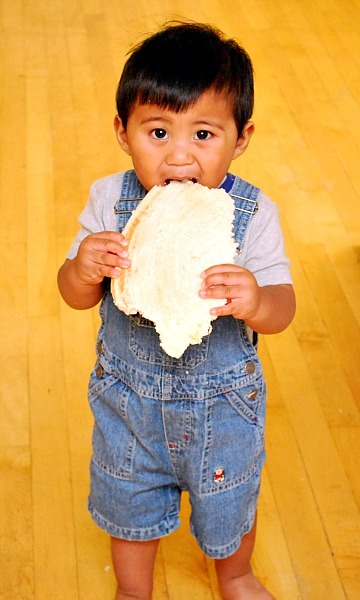 Thankfully the dough was pre-baked and he was fine eating it. Silly, hungry boy! Overall, it was a delicious kitchen playdate and we all had a great time! 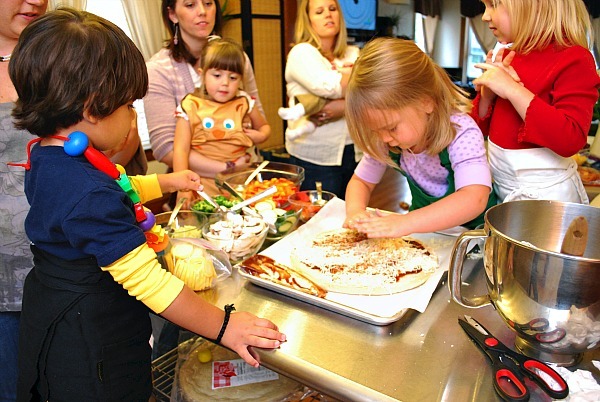 I encourage you to bring your kids into the kitchen and have a pizza party of your own. It's a good way to introduce healthy vegetables and ingredients to your family and have them involved in making something delicious. I am Yvonne @ StoneGable and found you through pinterest. YOur fabulous picture for the yummy sounding Pesto Chicken Stuffed Shells is amazing. I would like to make your shells for dinner next week. 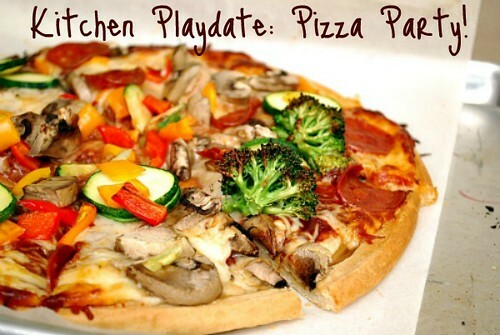 I have a weekly menu post on my blog and a meme (linky party) called ON THE MENU MONDAY. Could I use your recipe and image with credit and a link to your great blog! I would love my readers to find you as I have! I am a new follower and excited to see what other great recipes I can make. Nothing beats a good pizza for snacks. This is definitely one of the world's most popular meals.